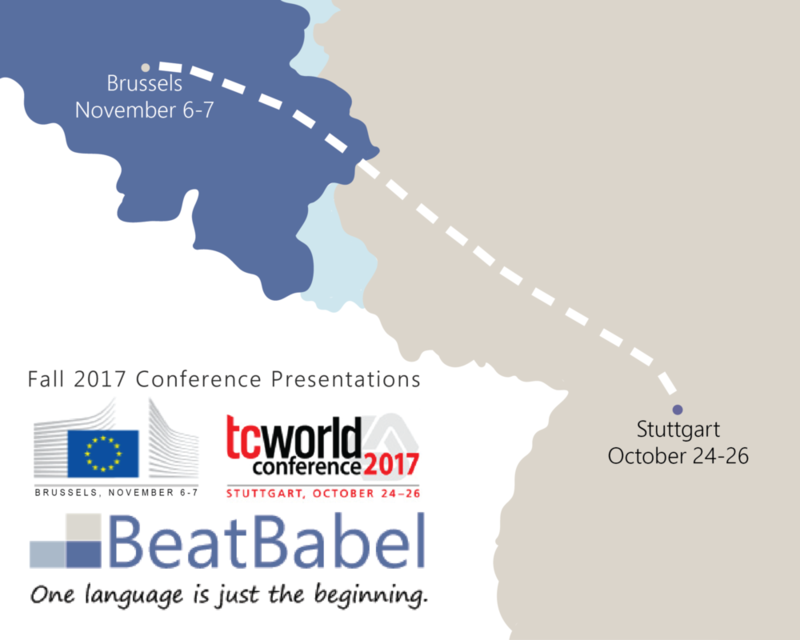 First, our very own Burckhardt Rueffer and Miguel Sevener will be presenting their talk from GALA 2017: “Size Matters: Exploring Big Questions on Change, Innovation, and Success from a Small LSP's Point of View” as the keynote for the GALA Localization Forum at tcworld Conference 2017. This will be their second tcworld Conference together and they are both thrilled to have the opportunity to bring their unique brand of tongue-in-cheek discussion of BIG topics to such a renowned conference. The annual conference based in Stuttgart, Germany, touches upon topics ranging from Augmented Reality to contractual law and gathered more than 4500 international participants and fair visitors last year. Burckhardt Rueffer, CEO, and Miguel Sevener, Account Manager, will be exploring the options for small Language Service Providers in this era of market consolidation and what they call “the language service colossi”. Their amusing but serious approach to explaining the alarming trends we are experiencing in the Language Service Industry was one of the best rated presentations at GALA 2017. Attendees who wish to join in and discuss options for a directed, sustainable growth for LSPs will be able to catch them on Wednesday 10/25 at 8:45 AM in Room C7.2 at Messe Stuttgart. In addition to tcworld , Miguel will be facilitating a roundtable at the Translating Europe Forum (TEF) in Brussels organized by the Translation Department of the European Commission. TEF is one of the key events bringing together Institutions, Academia and Companies involved in the Language Industry and it will be Miguel’s 4th edition as an active participant. This year, the conference focuses on exploring what new skills and competences young professionals need for employability in today’s changing market. With the most conservative assessments picturing translators as post-editors of Machine-translated content, and the most radical predicting the end of the employment society as we know it, the only thing that is clear is that the language industry is in for radical disruption. Those who would like to join in on the conversation about how young professionals can best prepare for this challenge should go to the plenary, roundtable session from 10:45 AM to 12:00 PM on Monday, November 6, 2017. Burckhardt and Miguel look forward to seeing you in Europe this fall. Don't be shy, come say hi! They will be more than happy to make new friends as long as you don’t steal the last croissant at the breakfast spread.